Ghostbusters isn’t due out until July, but the backlash to the first trailer for the rebooted comedy would have you think that it’s not only already been released, but it’s already received a critical mauling and tanked at the box office, too. Ghostbusters star Melissa McCarthy isn’t the least bit concerned about the vitriolic reaction to the trailer, though. In fact, the comedian refuses to even talk about. 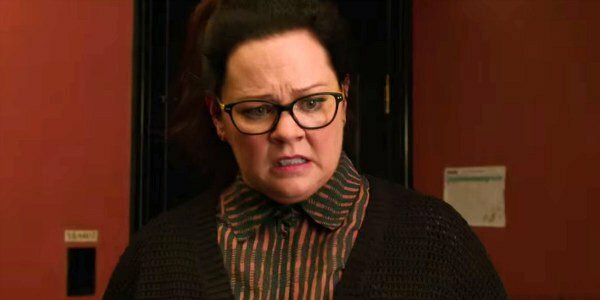 Melissa McCarthy kept mum about the reaction to the trailer while speaking with Yahoo Movies. In fact, all that the Bridesmaids and Spy actress would say is that she had a great time making it with her fellow leading ladies, Kristen Wiig, Kate McKinnon and Leslie Jones, and that she’s supremely confident it will still be amazing. I don’t even talk about it. We had such a good time filming it. The movie’s really good. The four of us talk constantly, and are always sending each other dumb notes. I don’t pay attention to any of that stuff. [Ghostbusters] was a blast making, it was really fun and the movie’s going to be amazing. There were some rather pointed outbursts regarding the trailer for Ghostsbusters when it was first released. Not only were people generally dismayed because it wasn’t as funny as they’d hoped, but people took umbrage with the fact that while the three white actresses all were employed as scientists the African American member of the posse has a job as an MTA worker. But while I’ll admit that I didn’t laugh out loud while watching the above trailer, the fact that I still haven’t seen the movie - which is over 3 months from being released – means that I haven’t yet labelled Ghostbusters as a failure. In fact, I’ll still be hugely surprised if it’s awful. Even from the trailer you can tell that Melissa McCarthy, Kristen Wiig, Kate McKinnon, and Leslie Jones have a terrific rapport, while Paul Feig’s recent track record of Spy, The Heat, and Bridesmaids tells you that he knows how to bring the funny. Plus Ghostbusters’ visuals looked great, as did the appearance of Chris Hemsworth as the ladies’ receptionist. Also, when most trailers nowadays pretty much show you an entire film in a 2 minute clip, shouldn’t we be rather relieved that Ghostbusters' didn’t include the film’s funniest moments? But, Melissa McCarthy has the right idea; all you can do when you make a movie is enjoy the ride and hope that people respond well to it. Besides, audiences will be able to judge for themselves when Ghostbusters is finally released on July 15.